The 2018 midterm elections are just over 30 days away and the concept of “voter enthusiasm” is dominating the national media conversation. Do Democrats have an edge because their voters are eager to repudiate the actions of the Trump Administration? Will the Republicans be able to fire up their base with a successful Supreme Court appointment? The same trend holds among Mason voters, but we consistently beat the national average voting rate by wide margins. Recent data from a national study (click on the chart to enlarge it) reveals that nearly 80% of eligible Mason voters turned out in the 2012 and 2016 presidential elections, while only about 30% did so in the 2014 midterms. 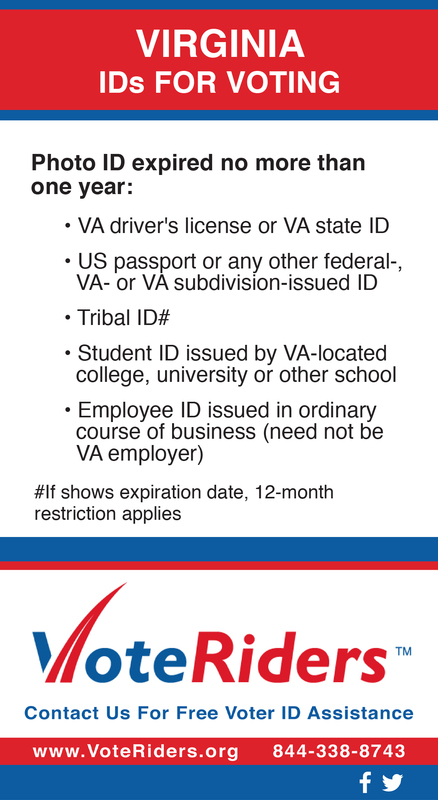 If you expand the population to include all Mason students (those who were eligible to vote and those who were not) 64.5% voted in 2016, while only 50.4% of Americans voted nationally. In both of the last two presidential elections, Mason beat the national average voting rate by double digits (+14.5% in 2012 and +14.4% in 2016). Of those students who were eligible to vote on campus at the university precinct polling place located in Merten Hall, a whopping 70% took advantage of that opportunity. 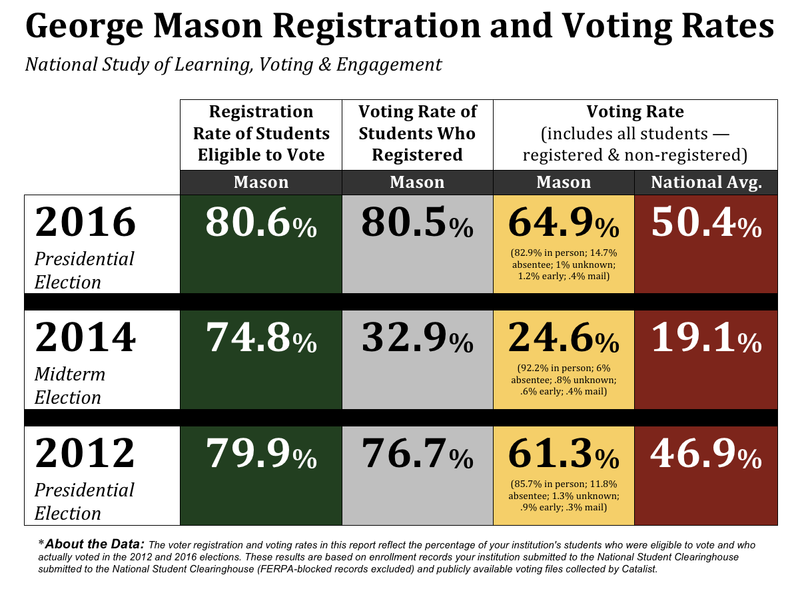 The data also shows that most Mason students who registered to vote (the 2018 deadline is October 15th) actually showed up on Election Day to cast a ballot. Only one-tenth of one percent of students who registered in 2016 failed to vote. 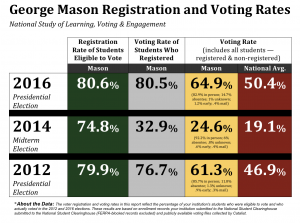 The low attrition rate between registrations and actual votes cast, taken with unusually high turnout in the 2016 election, suggests that Mason students are highly engaged in the political process and have a strong commitment to voting. Will voter engagement on campus continue grow in 2018, or retreat to more traditional midterm levels? Find out when Mason votes again on Tuesday, November 6, 2018!